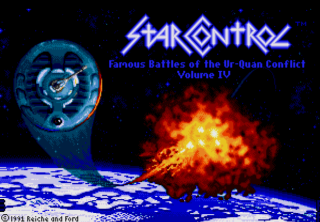 The Star Control series is not the most well known series of games but they have amassed a fiercely loyal group of fans over the years. This is largely thanks to the stunning second game in the series which, as some Red Parsley readers may know, is my favourite game of all-time. 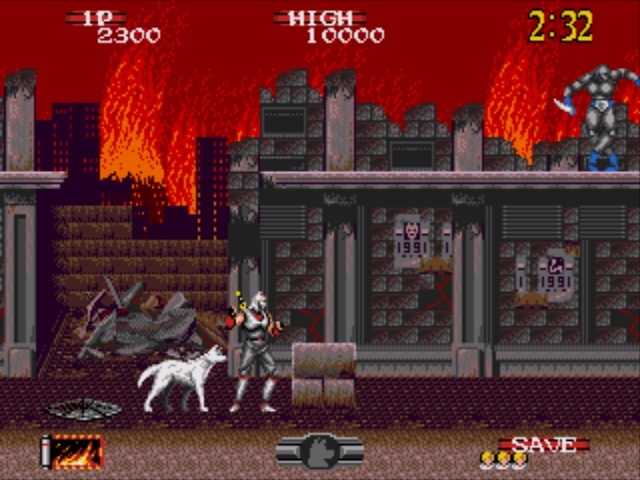 However, much of the groundwork for that game was done here with this under-appreciated original, including the creation of many of the series’ races and their associated mythologies. It was certainly an original and perhaps even unusual concept featuring a combination of two genres. Some loved it, some hated it. It’s also pretty complicated to explain, so here goes. The backstory for most of the races here was largely fleshed out in the epic sequel but about all you get told here is that there are two opposing space-faring empires – the Alliance of Free Stars (which includes Earth), who stand for a peaceful and prosperous galaxy and the Ur-Quan Hierarchy. Who do not. The Ur-Quan are an evil, oppressive race bent on enslaving and/or destroying all sentient beings in the galaxy, and the Hierarchy is the group of races they have conquered who have chosen to fight alongside them instead of remaining imprisoned on their home worlds. 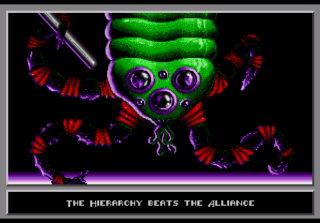 The Alliance and the Hierarchy each have seven races in their ranks, with each possessing one type of starship. 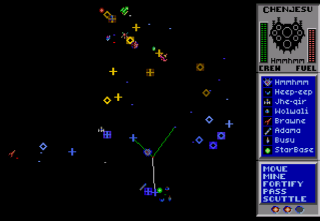 The main game in Star Control is a strategy game set on a single screen featuring a rotating starfield. This starfield is a spatial world, multi-dimensional and moving about a vertical axis and consists, largely, of many stars. 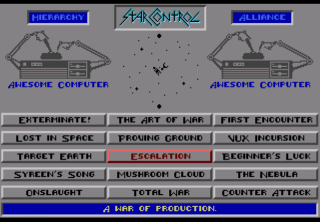 Before playing, you must choose your control options and which side you wish to play as (Alliance or Hierarchy). 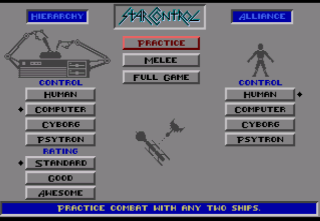 The control options are Human, Computer, Cyborg and Psytron. If you choose Human, then all decisions are made by you, choose Computer and all decisions are made by the computer (set one side to each setting for a normal single player game). Choosing Cyborg will result in the computer fighting your battles but you will make all strategic decisions, and Psytron vice-versa. The computer has three skill levels, and this can also be altered at this point. Once this is done, you then choose one of fifteen scenarios. These are basically missions with set objectives to achieve (which usually involve blowing the crap out of your opponent), although the starting conditions vary considerably, such as what resources you start with (if any). Each of the scenarios has a brief background story and are split into three groups of five – ones which start off in favour of the Alliance, ones which favour the Hierarchy, and ones which favour neither side (neutral). Most scenarios will see you start with a starbase – the Alliance one will appear at the very bottom of the starfield and the Hierarchy’s at the very top – and it is from this point that play begins. Gameplay is turn based with each turn enabling you to perform three ‘actions’, such as moving a ship, building a new ship or establishing a mine or colony, etc, before your opponent gets the same choices. 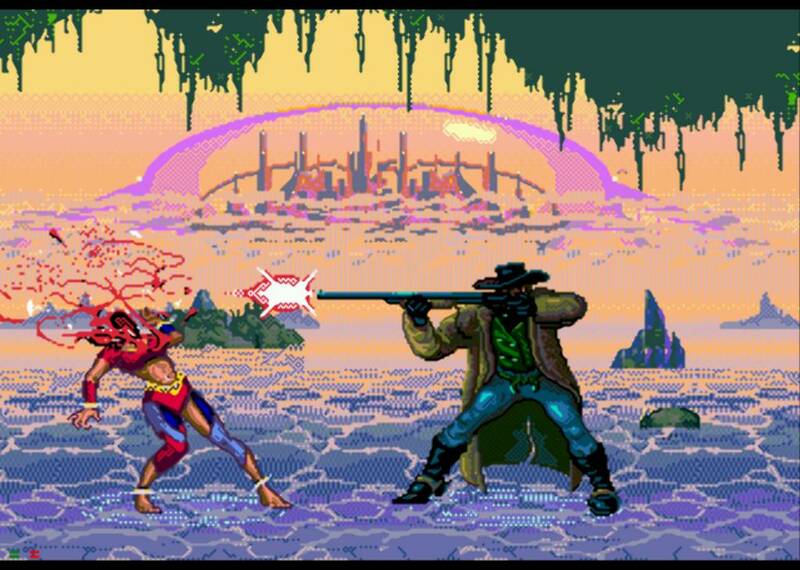 You can play against a friend, the computer or a mixture of both (Cyborg or Psytron). 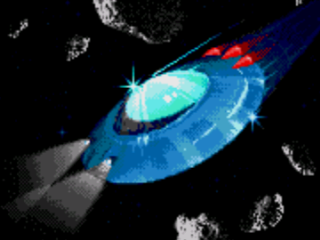 The object of the game depends on which scenario you choose, but most involve destroying the enemy Starbase/Starships. All the stars in the starfield will initially appear blue which means that they are unexplored. When one of your ships arrives at a star, it will turn one of three colours depending on which type of planet orbits it: white, green or red. A white world is a dead world and is valuable only for its strategic position (potentially). A green world is a life world which is suitable for colonising. A colony provides a place for a ship to recruit new crew members to replace those lost in combat, and also speeds up ship movements, as moving from a colony world does not cost an action. A red world is a mineral world suitable for mining. For each mine you have in operation, you will receive a Starbuck (the game’s currency) per turn in addition to the single Starbuck your Starbase generates per turn if you have one. It is possible for these colonies and mines to be destroyed much quicker than they were built, however. To destroy an enemy’s colony or mine, simply move one of your ships onto that star. If an enemy ship is guarding the facility, then a battle ensues – if you win the battle, then the facility is destroyed. If it is unguarded, then it is automatically destroyed. Bear in mind, however, that your opponent can do the same thing to your colonies/mines. Luckily, it’s possible to fortify your installations. A fortification is a defensive web which no single ship can easily destroy, and through which no single ship can pass (with the exception of two specially gifted ships). If you should move a single ship into an enemy fortification, your ship is stuck. To be freed, it can attempt to besiege it (which gives only a ten percent chance of success) or wait to be joined by another ship. Any two ships from the same side automatically destroy an enemy fortification. These conditions, of course, apply to both sides in a battle. Colonies, mines and fortifications all take two turns to build. 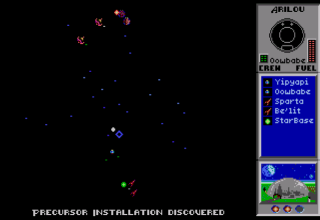 Movement and combat in Star Control is achieved via the use of Starships – you can move your Starbase (which takes all three actions of your turn), but you cannot fight with it. You might start your chosen campaign with a full compliment of ships or you might start with no ships – it again depends on which scenario you choose. You can have no more than seven ships in your fleet at any one time, however. If you start with none then you must build them at your Starbase. There are fourteen types of ship in total – seven Alliance and seven Hierarchy – though you’ll only be able to build ships from your chosen side. They vary in cost and ability considerably, though fortunately you can build more than one of any type of ship. For example, if money is tight, then you could build seven of the cheapest ship available relatively quickly in order to spread out establishing many mines and colonies until you’ve got enough money to build some better ships at which point you can begin attacking the enemy, but you could get attacked yourself as you’re attempting to do this, so some careful planning is required. At any point in the game, if one or more ship from opposing sides should meet at the same star, then battle will begin once that turn has ended. If your single ship met, for example, four enemy ships then you’ll have to fight them all, one at a time, until there is a winner, and you will be unable to visit a colony to replenish your crew until battle is over. Battles are fought in real-time and viewed from above, and the screen will automatically zoom in or out depending on how close together the two ships are. The screen also uses screen-wrap which means that if a ship appears as if it’s about to disappear off the edge of the screen, it will reappear on the other side of the screen. Gravity also comes into play in battles. Each ‘battlefield’, for lack of a better term, contains a planet. This planet has its own gravitational field which pulls in ships that stray too close, but you can use this to your advantage by using the gravity as a slingshot to fling yourself at high speed away from an advancing enemy. Contact with the planet can be fatal, however, especially if your ship has a small contingent of crew. 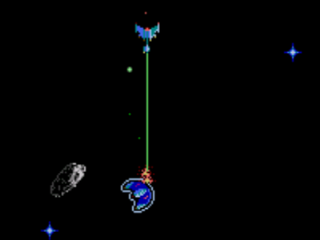 There are also asteroids flying about every now and then which do not possess any gravity, but can affect the path of your ship if they hit it, though these can be destroyed with a single shot. Providing a helping hand in battles, however, are the Precursors. The Precursors were a race who inhabited space approximately 300,000 years ago. Both their origins and subsequent demise are shrouded in mystery, but they did leave some of their technology lying around when they left/died out and it can be used to improve your starships. When exploring stars, you may stumble across one with leftover Precursor technology on it (or rather, on one of the planets orbiting it, but it’s the same difference as far as the game is concerned). If this is the case, you will be told immediately and the artefact is then automatically fitted to whichever ship is in use at the time. The ships themselves possess numerous characteristics which differ from ship to ship such as thrust, turning speed, weapon range, weapon damage etc. Each has a finite supply of crew and fuel. These are represented as small dots on the information panel on the right of the screen. 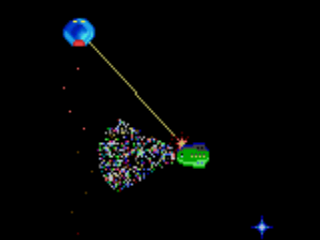 Crew members are lost when an enemy’s weapon impacts on the ship or if the ship crashes into a planet. If all crew members are lost then the ship is destroyed. The fuel powers the weapons and is reduced each time the weapons are fired. The fuel supply will automatically replenish if no weapons are fired but the speed at which it does so varies from ship to ship. 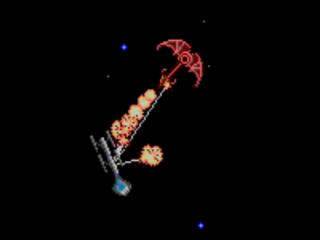 Each ship’s main weapon is different, but is generally a projectile type weapon with a specific range, which again varies from ship to ship. Each ship is also equipped with a ‘special ability’. This is sometimes another weapon, but is more often something else. Some examples include the Ur-Quan Dreadnought which can launch squadrons of autonomous fighters, the Ariloulaleelay Skiff can teleport, the Chenjesu Broodhome launches enemy fuel-sapping drones, the Illwrath Avenger employs a cloaking device, etc. 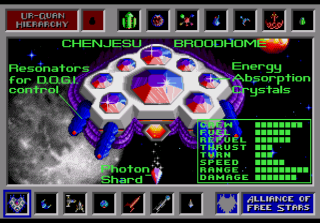 Star Control also features another play mode called Melee which is just the starship combat from the main game without any of the turn-based strategic play. Simply choose seven ships (from either side) and fight against your chosen opponent (human or computer) until one of you runs out of ships. This is basically a spaceship-based equivalent of a Street Fighter-style game with one-on-one battles to the death! 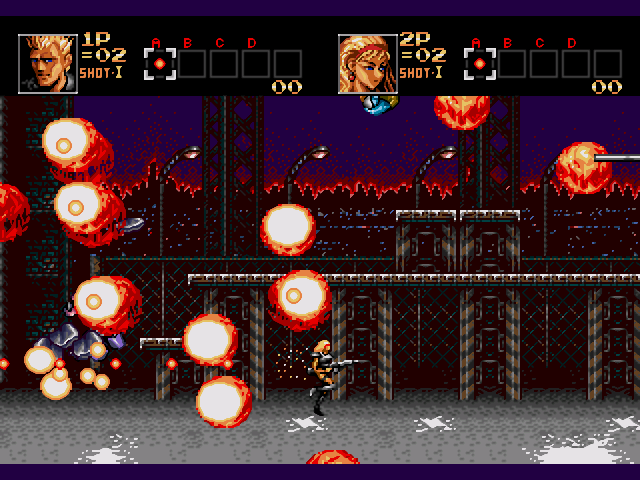 It’s entertaining fighting against the computer, which has three skill levels, but this game comes into its own between two human players. Some epic battles can be had here and it’s addictive as hell! A practise mode also exists in which you can choose a single ship and fight against your opponents single ship, again fighting one-on-one to the death. This is obviously the best place to learn each ship’s abilities and intricacies before braving a full-on war! 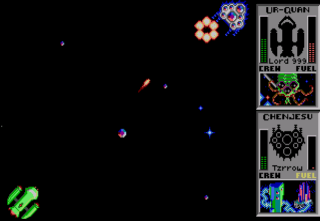 As you might have guessed from the screenshots, despite its gameplay innovations, Star Control is hardly the pinnacle of MegaDrive technical achievements. The graphics are functional with nice enough sprites but the backgrounds are all black starfields and there is precious little animation here. There are a few nice static screens though, including some good ship profiles, and the rotating 3D starfield in the main game is very impressive. There is no in-game music but there are a few short tunes here and there and each race has a ‘victory ditty’ played when their ship wins a battle. The sound effects, however, are excellent, consisting of a lot of sampled explosions, weapon fire, and even a few stranger things like a dog barking! 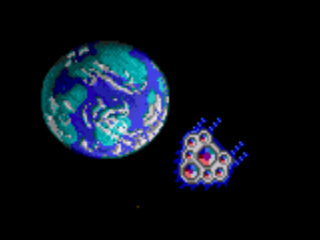 Star Control was a fairly unassuming game when it was first released and went unnoticed by many, but it nonetheless holds a very special place in my heart. This is partly because it led to my discovery of Star Control 2 (which I bought on a whim during a fleeting visit to my local second hand game store as a result of liking this game), but it’s also a great game on its own merits too. It’s a bit of an unusual concept, but one that, initially at least, proves highly intriguing. However, the main game won’t hold your attention for ever. It’s still enjoyable to return to, even once you’ve finished all the scenarios, especially when playing against a friend, but the fantastic Melee mode endures to this day! I fondly recall many great battles against friends in this mode, particularly against my good friend, Stu (“If I hit a planet, it’s a draw!”) and it remains one of my favourite two-player games even now. But hey – even if it sucked, it still gave birth to the mighty Star Control 2!